This amazing seven pieces matching chairs and oval table signed Old Hickory. All in very good condition. The tabletop is a marque inlaid top. Measures: Armchairs 41 x 28 x 28 only on arm chair in stock. Side chairs 41 x 19 x 19 Seat height for both is 17.5. By Old Hickory Furniture Co. Stamped Old "Hickory Martinsville, Indiana" bench with a cutout carrier on top. It is stamped on underside of the top of bench. The condition is very good. 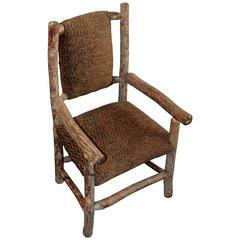 This amazing hickory children's chair is upholstered in cotton durable fabric and in very good condition. Seat height 14 in high. This set of matching Old Hickory chairs from Martinsville, Indiana are in pristine condition and upholstered in a red striped cord fabric. They are very sturdy and comfortable. Old Hickory dining table with inlaid wood tabletop. The condition is very good , strong and sturdy. Great form and condition. Mid-Century Modern set-folding dining table and six chairs, 1960s. Measures: Table: W 36 / 150, D 80, H 73 cm. Chairs: W 48, D 48, H 70 cm, seat H 42 cm.